Contemporary Literature, vol. 47 #4. Contemporary Literature and the State, vol. 49 #4. 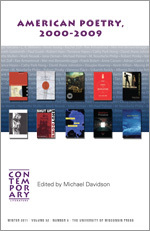 Online access to Contemporary Literature is available as part of the Project MUSE collections. 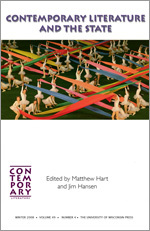 All back issues of Contemporary Literature beginning with Vol. 1, 1960 are available online through the JSTOR digital archive. 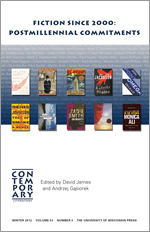 Some back issues of Contemporary Literature are available online as part of a paid subscription. 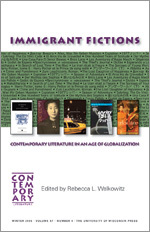 Anyone may view TOC's, abstracts, and a sample issue for free at cl.uwpress.org. Access may also be purchased on a limited term basis for a specific article or issue. Single articles may be purchased online at cl.uwpress.org or through the JSTOR archive. Print copies of single articles may be ordered here.